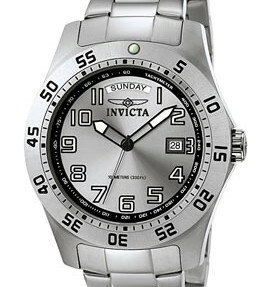 If you’re looking for a diving watch with a look that differentiates itself from other diving watches, Invicta’s 5249 pro diver Stainless steel watch is an affordable solution that has both form and function in mind. The first thing you notice about this watch is are the two different date dials. At the 12 o’clock mark, there is a dial that displays the day, while a date dial squishes the 3 numeral to show you the date. It’s rare to see a day dial on a watch, and while it’s relatively easy to remember the date, having a classy reminder on your wrist is always a plus. The 3rd numeral being squished by the date dial may not be ascetically pleasing to everyone, but it’s something that you can easily overlook. 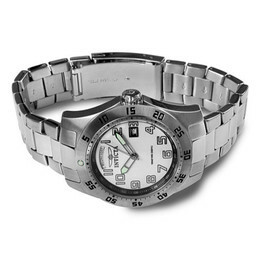 The Stainless steel watch is good for divers who need a cheap watch that functions well. The diving watch has a water resistance of 300 meters, which is standard for most diving watches. The omnidirectional bezel is useful for marking down minutes for your air supply. While this watch is made for diving, it’s also great for just wearing around everyday. It’s functionality is useful both in and out of the water. The bezel is great for timing things such as parking meters and cooking food. You may not like the unconventional placement of the date subdials, but if you’re willing to overlook those aesthetics, and look at it’s neat functions, the Invicta 5249 is great for diving, as well as for regular, every day use. It’s just about respectable enough to wear on formal occasions, but this watch definitely has more casual uses in mind. This diving watch comes at a great price as well. 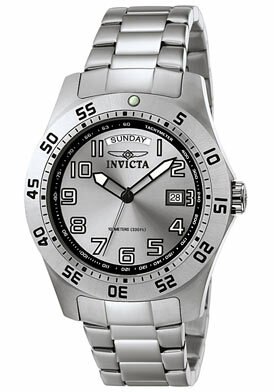 The retail price of this watch is around $325.00, but You can find this watch on Amazon for $54.00. If you need a diving watch, but need it for cheap, this is a great deal. Copyright © 2011Invicta Reviews, Inc.